MUSIC FOR CELLO AND PIANO. Paganini Variations on one string on a theme of Rossini; Dvorák Quiet Forest Op 68 no 5; Ginastera Pampeana no 2, Op 21; Mendelssohn Song Without Words Op 107; Tchaikovsky Pezzo Capriccioso Op 62; Fauré Après un Reve Op 7 no 1; Saint-Saëns The Swan (Carnival of the Animals); Janácek Pohadka; Falla Suite Popular Espanola. 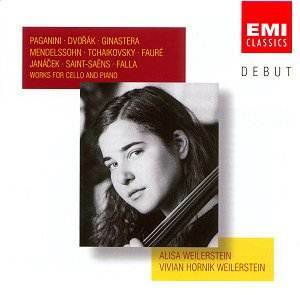 Alisa Weilerstein (cello), Vivian Hornik Weilerstein (piano) EMI Classics, Debut Series CDZ5.73498 2 [DDD] [62' 38"]. This debut recording is recommended although I wish Ms Weilerstein had included a substantial work such as one of the Beethoven or Brahms sonatas since that would enable any reviewer to assess how she deals with musical form or structure. The recorded sound is good although is a little distant in the opening of the Paganini and my copy stuck twice in the Tchaikovsky but that did not trouble me too much as this piece is rather poor. He did not understand the cello very well as seen in the ghastly quick passages of the Roccoco Variations. The performances are good. There is some phenomenal bowing and articulation in the Paganini ... quite extraordinary and equally magnificent. It held the attention unreservedly. For those who love cello music this performance was spellbinding. The Ginastera is the best work on the disc by far and is given a totally convincing and indeed a compelling performance. I felt that the Mendelssohn was a shade too fast and some of its exquisite loveliness was sacrificed as a result. The Janácek was most enjoyable. The Falla is very well played ... so much so that it sounds a good piece. Watch out for the three blind mice!